Feb. 2, 2011, 10:30 a.m.
By Justin Ellis @JustinNXT Feb. 2, 2011, 10:30 a.m.
It’s been interesting to watch how different outlets curate their coverage of the political turmoil in Egypt. As we’ve already noted here, some, like Mother Jones, have gone the route of an informal and accessible explainer; others, like the Huffington Post, are aggregating what they can find. Still others, like NPR’s Andy Carvin, have seemingly dedicated their Twitter accounts to updating news on Egypt. All of this is to be expected as major news organizations try to do what they do best: help readers make sense of what’s happening in the world. But it’s not just news organizations and individual journalists doing that. You can also find noteworthy coverage on Tumblr’s Egypt page. It’s a real-time example of Tumblr’s curated tag pages, a new feature the company rolled out about a month ago. The feature lets a group of editors (Tumblr users) select the choicest cuts from their feeds for public consumption. The pages originally broke down into areas like fashion, design, long reads, and a general news page. The Egypt page is a step beyond that, an on-the-fly means of developing a news channel from the minds and links of users. With no overriding editorial “vision,” at least in the traditional sense, what you get is a collection of breaking updates, stories providing desperately needed context, and, naturally, one of the things Tumblr is best at: photos. The page is edited by people like Joshua Nguyen, a Tumblr designer; Fast Company writer Neal Ungerleider; and Anthony DeRosa, the co-founder of Neighborhoodr.com who now works for Reuters — and by outlets like The Atlantic. The idea is that these curators all follow a wide group of people. They’re power users who are constantly finding new and interesting things on Tumblr, so by reading the curated page you’ll see a lot of things by people you might know about. The main thing is that you should be able to follow a particular curated tag and be introduced to a new Tumblr blogger via a post the person has done. Sure, it’s a response to how people use Tumblr and the ways they ingest their information. But what it also seems to demonstrate is Tumblr’s journalism sensibility. Tumblr is growing at an accelerated pace: by 250 million pageviews every week, according to founder and CEO David Karp. And there’s no shortage of news organizations jumping on board. Coatney said that curated tag pages offer value to news organizations, as distributors, as well as a new way to discover which types of news are important to readers. “I think there’s some good insight to be gained from seeing what non-news professionals view as news,” Coatney wrote. By making inroads to media and adopting the tendencies and sensibilities of journalism, Tumblr could make friends with content providers while, at the same time, distinguishing itself from others in the world of social media. It’s got more wiggle room than 140 characters, and it’s a network that’s defined less by personality and friendships and more by the value of shared information. It has the raw material, at any rate, to shape an alternate news feed. POSTED Feb. 2, 2011, 10:30 a.m.
Ellis, Justin. 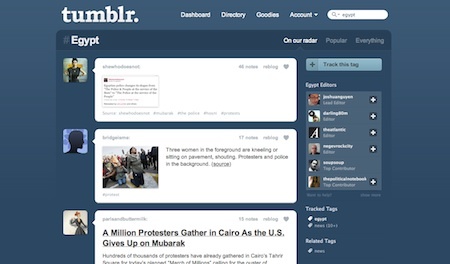 "Tumbling into journalism: Tumblr’s newsy tag pages." Nieman Journalism Lab. Nieman Foundation for Journalism at Harvard, 2 Feb. 2011. Web. 25 Apr. 2019. Ellis, Justin. "Tumbling into journalism: Tumblr’s newsy tag pages." Nieman Journalism Lab. Last modified February 2, 2011. Accessed April 25, 2019. https://www.niemanlab.org/2011/02/tumbling-into-journalism-tumblrs-newsy-tag-pages/.